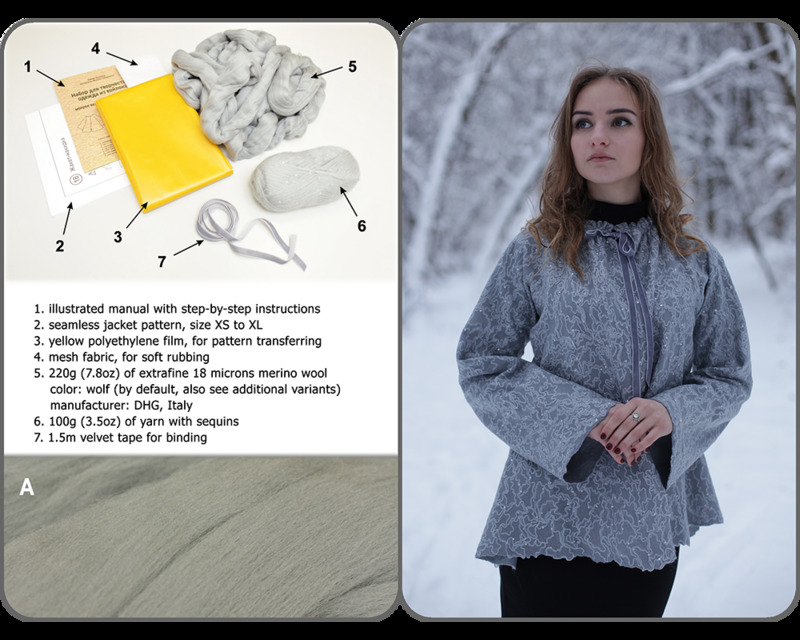 #18 Cape jacket "Winter Fairytale"
Our new kit is for all those who want to practice in felting on the example of a short light seamless cape (jacket) with a flared silhouette, wide sleeves and folds. This universal style is suitable for different women's figures. We need to obtain a very thin, airy, soft, easily draped felt, gleaming in the sun with bright sparks of sequins. This is "all-in-one" kit that contains everything needed to help you make your first seamless jacket, except some little things: a water scoop, a towel and soap. We've gathered all the materials: an extra fine Australian merino sliver, yarn with sequins and other accessories . NOTE!!! Suitable for advanced feltmakers.